When I was at school those of us with home micro’s were split into two main camps – the Sinclair owners and the Commodore owners. Debate raged day in and day out as to whether the best games were to be found on the ZX Spectrum or the Commodore 64. But if your Dad happened to be a school teacher, then you got to be part of a much smaller group, the BBC group. Nearly all of the BBC owners I knew had parents who were teachers, and mostly they were Maths Teachers! The only organised computer group at School was a BBC Owners Group and it was run by the Music Teacher. And let’s be honest, whilst it looked like they were going to be discussing programming, we all knew once inside, they were all copying games! The guy I walked to school with, David, had a BBC Model B for Christmas. He had the proper Monitor and even a twin disk drive for it. Better still, his Dad taught Maths (of course!) at the local Poly. Not only did he have access to a ton of games on hand bought by the Maths Department (for ‘research purposes only’ of course!) but his Dad copied most of them to floppy disk. Being invited around to his house to play games was like being invited to join some sort of secret society. The BBC Model B did have a reputation as being a bit of a ‘boffin’s machine’ (can you guess why?) but let’s be honest, the games that Acornsoft were putting out were streets ahead of the stuff that us lowly Commodore and Sinclair owners could get our hands on. To us, the words ‘arcade version’ were often dirty words, leading us disappointingly to a lukewarm representation of a great arcade game we’d played at a seaside arcade. But on the mighty BBC, these guys got the best home versions around of “Defender’ “Galaxians” and “Scramble.” – ( “Planetoid” , “Arcadians” and “Rocket Raid” and I don’t have time to mention “Killer Gorilla” here either!) The only downside was that all the BBC joystick were those rubbish potentiometer ones, the ones that Dragon 32 owners also had to suffer with. They were rubbish. But for most games, it was mechanical keyboard ahoy. In early 1984 I went around to his house to see a new driving game I’d heard a lot about. 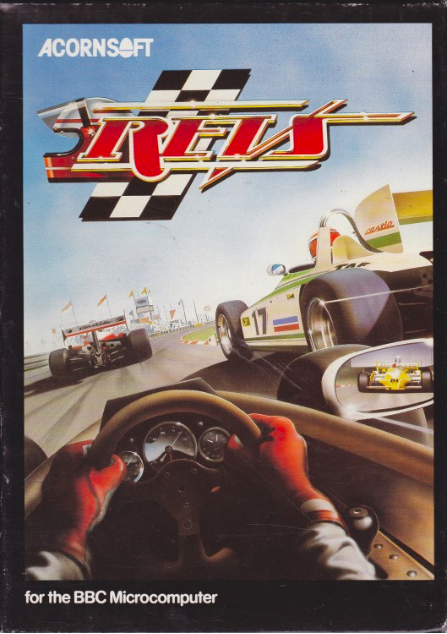 It was called “Revs” and of course, was put out by Acornsoft. This was my first introduction to the work of legendary UK programmer Geoff Crammond. The year before he’d put out a Beeb flying game called “Aviator” but I wasn’t so interested in that. Looking back “Revs” continued the early 1980’s trend of trying to be The Hardest Game In The World. It was my first experience of playing a ‘real driving simulator’ experience. It also had a killer piece of artwork on the cover. And it wasn’t just me, I know countless other people who bought this game because they were wowed by the box art. The game was nigh on impossible. 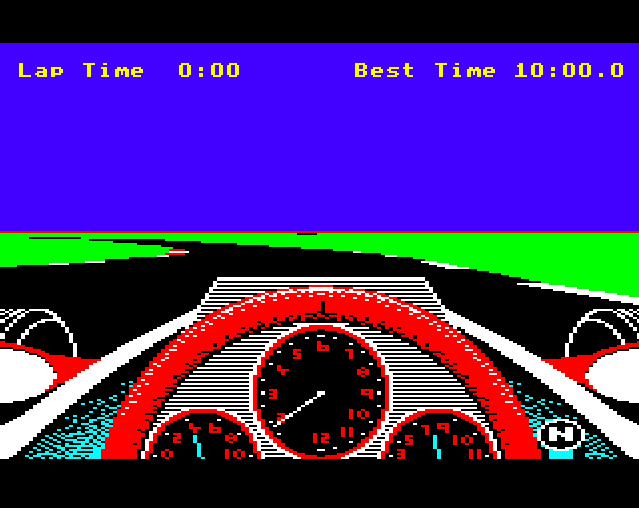 Like “Road Race” before it, you had to master steering, accelerating, and trying to do the gears. Most people gave up whilst being stuck in the Pit Lane. The idea was that you had to Qualify and then take part in a Race. But nearly everyone I know failed to complete even the Qualifying Lap. The visuals were astonishing for their time, no-one had yet seen an F1 cockpit display on screen. But by God it was rock hard. It was also the first racing game I ever played that had Hills in it. The track went up and down as you drove around Brands Hatch. After you’d seen that, there was no going back really. Geoff Crammond continued with driving games, going on to develop the “GP” series of games for Microprose. Some people still rate the amount of stuff he managed to put into his software over some of the top tier games of today. And to see what he was able to do in Software-only on the early PC’s was quite incredible. He remains one of my all-time heroes of game development. I was lucky enough to bump into him outside the ECTS trade show at London’s Olympia in 1995. I saw his exhibitor badge as he walked by me and being thrilled with excitement stepped into his path to introduce myself and shake his hand. He’s known for being a shy type of person and responded with a wonderfully uncomfortable, “Erm!” before stepping aside and getting into a nearby taxi! Oh well! See you next week for Part 6.